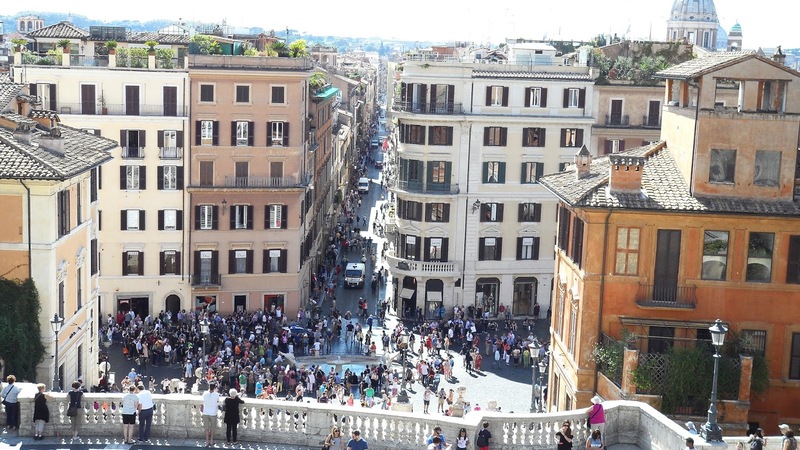 During our time in Rome, another key place that I wanted to visit was the Spanish Steps; as with most of the places we visited during our time in Rome, we accidentally stumbled upon finding the Spanish Steps. We had decided to take a stroll one afternoon and visited lots of the shops that Rome had on offer; I managed to find a Brandy Melville store down one of the streets and I inevitably forced Alex to come in with me. I've never actually been inside a Brandy Melville store so I was like a kid in a candy store when we stepped inside. The outcome? I wanted to buy everything. 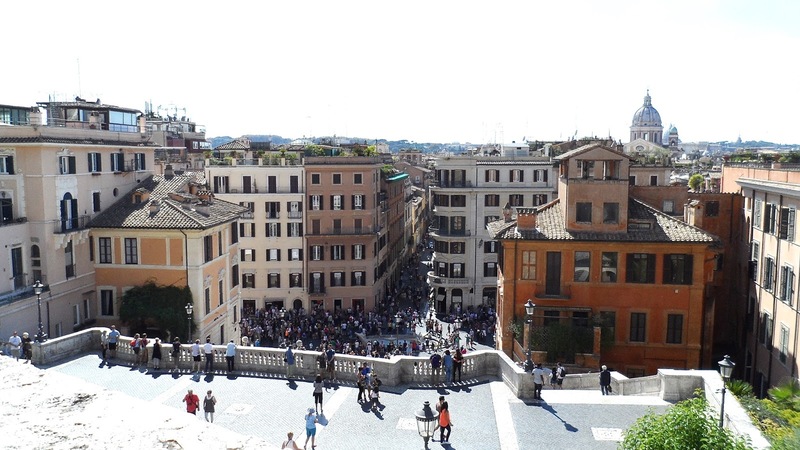 Once we had finished browsing the shops, we continued walking until we found the Barcaccia Fountain in Piazza di Spagna, then looked right and there they were, the Spanish Steps. The street around the fountain was filled with crowds of people and the weather was equally perfect to spend time in the main square by the fountain too. As we were walking towards to the Spanish Steps, we spotted all of the usual tourist traps with people trying to sell selfie sticks and roses. Now, I'd like to think I'm quite savvy and instantly say no when approached to buy anything from the street sellers, however, one man insisted on me taking a rose and said it was an Italian gesture. I said I didn't want one, and then naively, proceeded to take one and walk up the stairs when the man told me that they were free and it was a token of kindness. A few moments later, we looked back and found that the man was following us. He then asked Alex if I was his girlfriend and continued to ask for money for the rose, pressuring Alex to pay for it. At this point, I was pretty embarrassed that this was happening in the middle of the crowds sitting on the steps and I handed back the rose and rushed up the stairs. It was an eventful encounter to say the least. Note to all future visitors, do not take a rose. You'll thank me later. All of the drama aside, we carried on up the steps until we reached the very top. 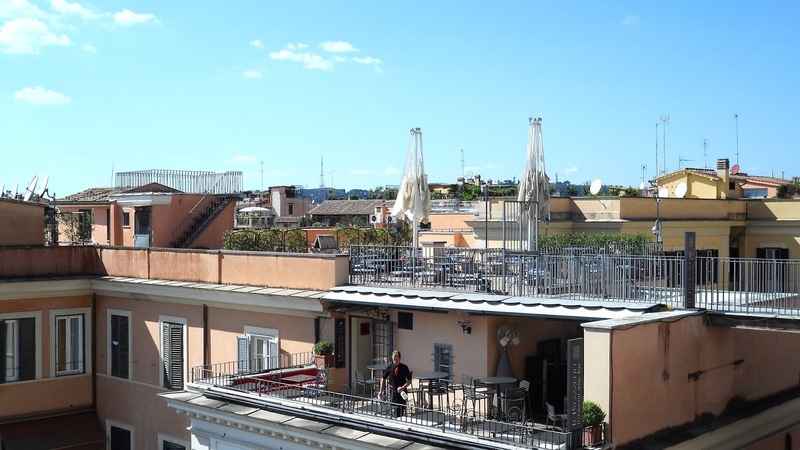 The top was far quieter than it was around the fountain and went spent our time taking in the views of the surrounding scenery, including the distant St Peter's Basilica. 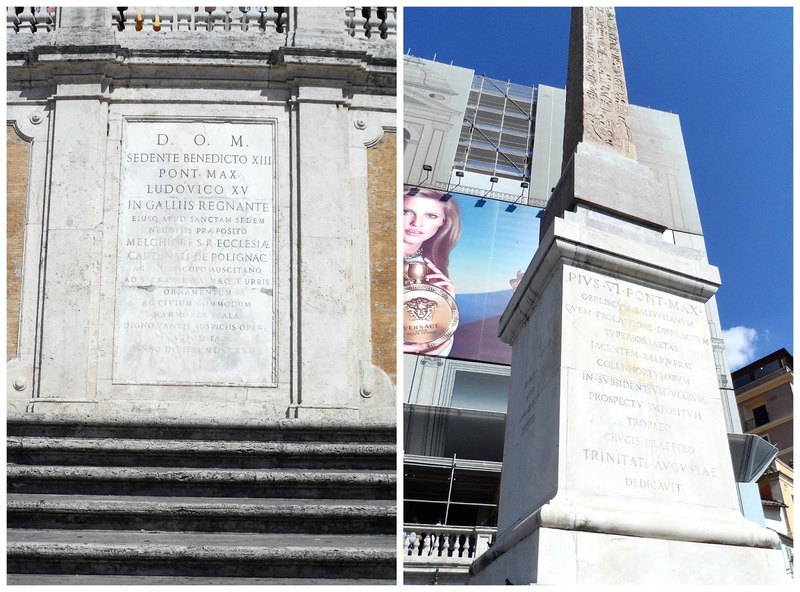 It was well worth the walk for the serenity that we felt at the top, dominated by the Trinita dei Monti Church. I absolutely loved the architecture of the buildings around us and all of the beautifully rustic shades of orange and brown that the walls were painted in. 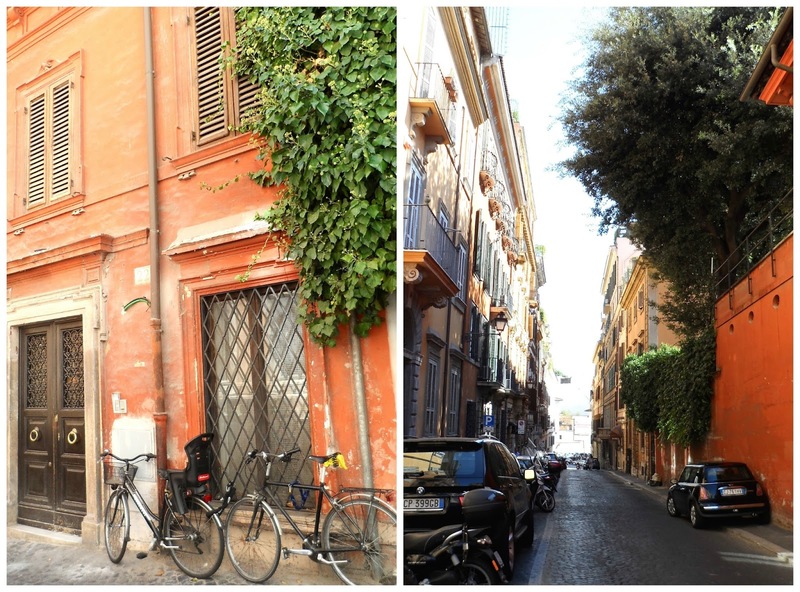 The surrounding streets were equally as peaceful and I couldn't resist snapping a few shots down the quiet cobbled roads of the rust-coloured walls and delicate balconies. 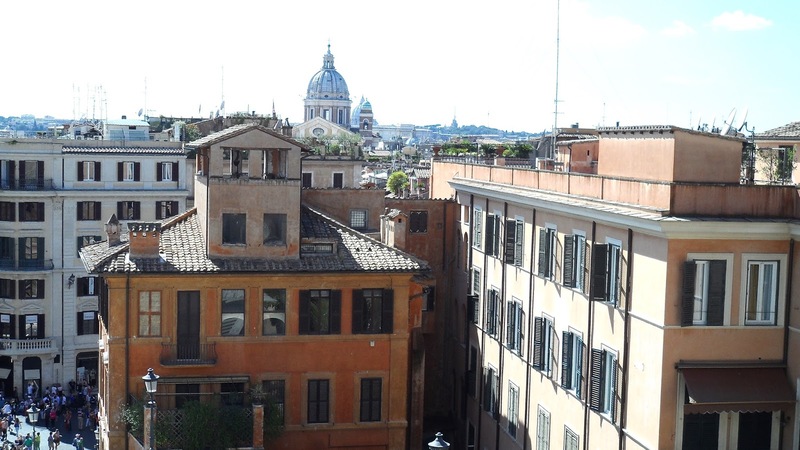 Great photos - I loved the Spanish Steps and these photos take me right back!